Join the ThreadsMagazine.com Insider community and get unlimited access to the entire site, including expert technique videos and much more. Already an Insider? Log in to access all Insider-only content. Watch hundreds of expert videos, including techniques and details you won't find anywhere else. 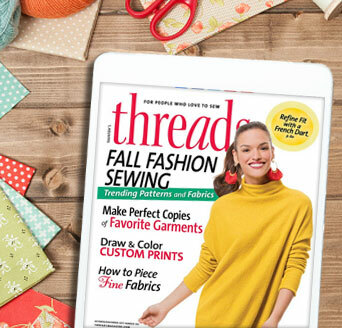 Get a one-year digital subscription to Threads magazine to read on your computer or mobile device. Access over 270 in-depth articles (even those out of print) so you can dig deeper on a huge range of topics. Enjoy access to over 100 exclusive Threads Insider projects. See garments from all sides to get the full impact of the piece. Atacac: Shareware No. 17 /-shirt is a one-piece pattern for a top with an asymmetrical V-neckline and angled front seam, Y-shaped back seam, and sleeves that wrap from the back panel and are inset into the front armscye. Atacac offers patterns for free. The downloadable PDF is available in size 3 only, although sewers with CLO 3-D software can access all five sizes. There are no sewing instructions, yardage amounts, or supplies listed. A size 3 sample required 1 1/2 yards of 60-inch-wide fabric. Most matching edges are labeled with letters. The front neckline and sleeve hems are finished with a narrow binding, and the back neckline has a cut-on facing. Our seamstress found this finishing awkward, as it left a gap between the facing and the binding at the back neckline. Drapey, light- to medium-weight knits work best with this T-shirt design. A stripe plays up the unique construction. This T-shirt pattern was reviewed in Threads #201, Feb./March 2019. Rotate: Click and drag your mouse over the garment to rotate or use the left/right arrow buttons provided. Zoom: Use the plus/minus buttons to zoom in on garment details and then use arrows to rotate. 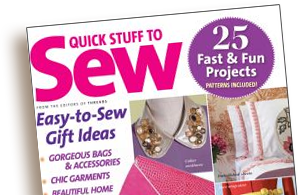 Being a ThreadsMagazine.com Insider is like having a mentor you can turn to with all of your sewing questions for less than $3.50 a month.